eMammal is a project where citizen scientists work in collaboration with researchers at the Smithsonian Institution and North Carolina Museum of Natural Sciences to document mammals throughout the mid-Atlantic region, and soon, the entire country. Citizen volunteers place “camera traps”, infrared activated cameras, across the landscape in parks and other natural areas to collect photos of mammals. These photos help researchers answer questions about mammal distribution and abundance and use this information for conservation. The first phase of this project was the Smithsonian Wild prototype funded through a grant which has evolved into eMammal. To help manage the new camera trap data, Blue Raster and partner Orion Creative Group built a camera trap management and identification system. 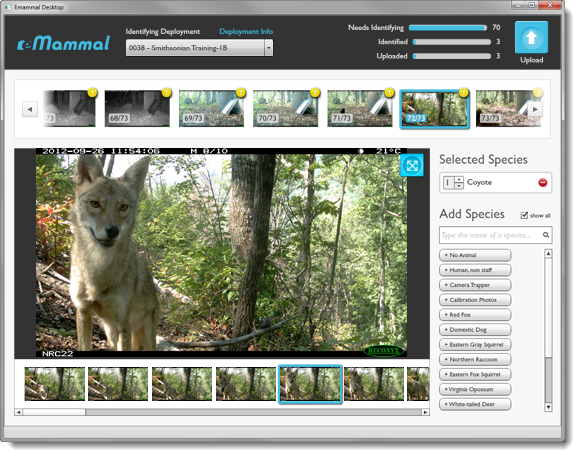 Deployed on Drupal 7, the system manages volunteer and camera trap data for the research team. An Adobe AIR Desktop application allows citizen scientists to identify ‘captured’ animal photos and upload to the image repository in Amazon S3. Then the camera trap photos and metadata are collected by eMammal scientists and analyzed. “eMammal is at the cutting edge intersection of the new technologies surrounding cloud computing and “big data” and the time honored tradition of citizens volunteering to help conservation efforts,” said Smithsonian Conservation Biology Institute Conservation Biologist, Tavis Forrester, Ph.D. The next phase of eMammal will be the creation of a robust website where photos will be displayed along with project site information. Crowd sourcing for species identification will also be explored. Keep an eye out in 2013 for these great additions to the eMammal project. Visit http://facebook.com/eMammal to see a sampling of the best photos and keep up to date on our progress.